Keith Riley is our site manager. If it is broken, not working, in the wrong place, etc. you call Keith and all is made right. 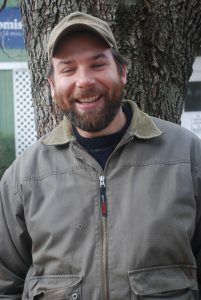 Keith grew up in New England and is a graduate of Johnson State College with a B.S. in Environmental Science, Natural Resources. He is also a certified Emergency Medical Technician (EMT). He is a former San Mateo Outdoor Education Intern, and has also worked for Sagehen Outdoor School in Truckee, California, as well as Pigeon Point Environmental Education Program. Prior to moving to California he worked at the Trapp Family Lodge (the family that “The Sound Of Music” was based on). He kept the “hills alive” as a Guest Activities Director supervising staff facilitating summer camp activities and as a Teen Coordinator organizing nightly activities and events. He loves fly-fishing, tying fly’s, disc golf, hiking, tubing, mountain biking, snowshoeing, and Nordic and downhill skiing, tide-pooling, critter hunting and maple syrup. His talents include playing guitar, harmonica, writing children’s books, carpentry, and fixing anything that is broken. Keith recently moved back from the West coast to take the site manager job at Common Ground. When not at work Keith spends time with his wife and two young sons.